Do you wish often to get pearly white teeth like those models of TV commercials? But it’s known to all of us that regular brushing may kill germs and bacteria of the gums and teeth, but surely it cannot provide pearly white teeth. 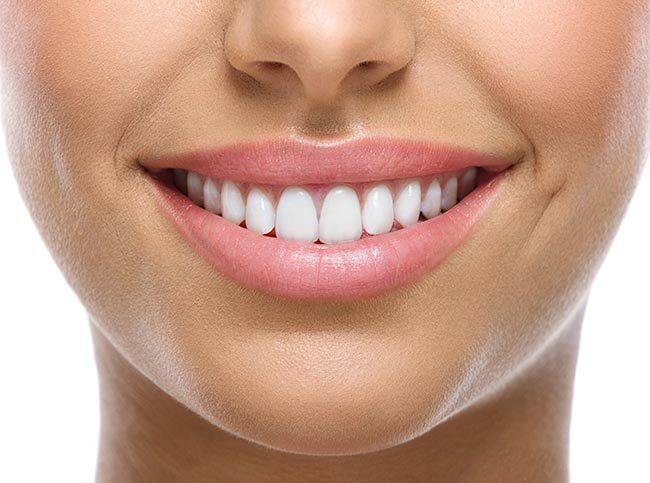 It’s not obvious to have white teeth, but white teeth add more confidence to our image when we smile. Fortunately, we can get rid of yellow teeth by following some simple treatments at home. Baking soda is the best natural treatment to remove yellow stains from teeth. It is also useful to remove plaque and kills germs. First, mix a teaspoon of baking soda with a bit of toothpaste. Then brush the teeth with the mixture and gargle with warm water. Do this twice in every week. Alternately, mix baking soda with white vinegar, hydrogen peroxide and lemon juice and use it as a mouthwash after brushing. With half a tablespoon hydrogen peroxide and one tablespoon of baking soda, you can make a whitening mouthwash. Use this mouthwash twice or thrice a day. You can also rub baking soda mixed mouthwash on teeth. But do not overuse. Overuse of this may wash off enamel from teeth. This vitamin C enriched ingredient visibly washes off yellow stains from teeth. Rub the orange peel every night before going to sleep. The vitamin c and the acid will revolt against the germs and the bacteria all through the night. Continue this treatment for two weeks. You can also preserve orange peel as powder for future use. Sundry some orange peels and make a powder from them. Keep the powder in a dry jar and use it to rub teeth in the future. Grind and make a paste with it and rub it on your teeth twice a week. Another good way is to mix a pulp of the strawberries with half teaspoon of baking soda and apply the paste directly on your teeth. Keep it a few minutes and then wash off. Make a habit of including hydrogen peroxide in your regular oral care. Make a mixture with baking soda and hydrogen peroxide and use it as a mouthwash twice or thrice a week. The lemon is quite famous for its bleaching property. The lemon juice and lemon peels are an ancient way to treat yellow teeth. Rub it on your teeth vigorously and leave it for a few minutes. Then, rinse your teeth with water thoroughly. Do it twice a day. Salt has very effective property to cleanse the teeth and make them strong enough. Mix salt with charcoal to wash your teeth. Rub this powder on teeth and you will get white teeth instantly. While you use salt, you have to be careful as salt may rip off natural enamels from teeth. Keep some holy basil leaves in the sun and let them dry. After this grind the leaves into powder and mix the powder with your toothpaste or tooth-powder. The anti-septic property of basil leaves keeps gums and tooth germ free too. You do not need to apply anything from apple on your teeth. Just include one apple in your regular diet. While eating, make sure you are chewing it well. Other foods like cucumber, carrot and broccoli is also useful for teeth.